U-shaped Cut-out Design: Provides support and comfort while reducing pressure on the coccyx/tailbone with the U-shaped cut out and promotes healthy posture. Cooling Gel and Nylon Cover: NEX gel memory foam cushion is encased in machine-washable zippered mesh cover. Provides cooling, breathable feeling and easy to clean. Lightweight and Portable: Measuring just 2 pounds with dimensions of 17.3 X 14.5 X 3 inches, and it is easy to transport. Use it during travel, at home, in the office. FULLY GUARANTEED: Your satisfaction is our highest priority. 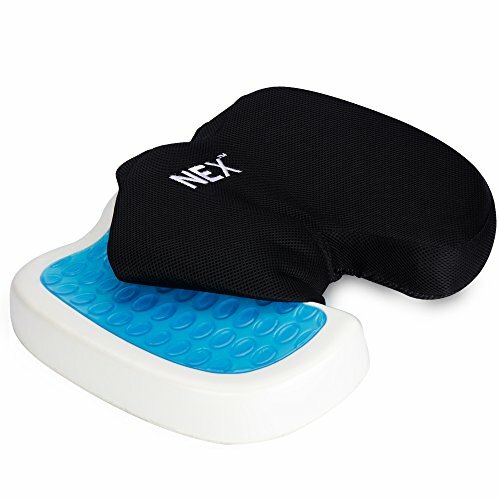 If you have any problem of the NEX gel memory foam cushion, please feel free to contact with us. ERGONOMICALLY DESIGNED SEAT CUSHION: U-shaped design allows you to reduce pressure on coccyx/tailbone/spine. This ensures that the coccyx/tailbone dose not touch the sitting surface and prevents lower back problems, sciatica, tailbone injuries, pregnancy back pain, herniated and other spinal issues and promotes healthy posture. THE GEL ENHANCED MEMORY FOAM CUSHION: Made with premium quality 100% memory foam with cool off gel layer on top and fitted BREATHABLE NYLON COVER for superior comfort. The hygienically designed for ventilation can increase the permeability and prevent bacterial propagation. ALL-IN-ONE FEATURES & HIGH-DENSITY MEMORY FOAM CUSHION: NON-SLIP rubber bottom, machine-washable zippered nylon cover for EASY CLEANING and BUILT-IN HANDLE for easy transport. Body active memory foam keeps its shape to provide the best, long-lasting support. Ergonomically designed to evenly distribute weight and promote the user to keep healthy posture and align the spine. PERFECT FOR ANY PLACE YOU SIT: Provides comfort on most hard surfaces; office chair, car seat, airplane, wheelchairs, bench, kitchen, patio, dining room, living room etc. even kneel on it when performing housework. Provides superior comfortable experience for trucker driver, travelers, office staff, pregnancy and anyone with spinal issues. LIGHTWEIGHT AT JUST 2 POUNDS FOR TAKE-ANYWHERE COMFORT: Measuring just 2 pounds with dimensions of 17.3 X 14.5 X 3 inches, the seat cushion is portable and light enough to be carried everywhere you need extra support.